Hadfield is a town in the High Peak of Derbyshire, England. The population of the town's wards in the 2011 Census was 6,305. It lies on the south side of the River Etherow, the border between Derbyshire and Greater Manchester, at the western edge of the Peak District close to Glossop. Hadfield lies between Bottoms Reservoir and the Glossop Brook, on the southern side of the River Etherow valley, which is known as Longdendale. The town lies between 394 feet (120 m) and 690 feet (210) m above sea level. Hadfield is 12.5 miles (20.1 km) from Manchester. Hadfield was part of the Manor of Glossop, and at the time of the Domesday survey belonged to William the Conqueror. King Henry I granted the land to William Peveril. In 1157 King Henry II gave it to the Abbey of Basingwerk. In 1537 King Henry VIII gave it to the Earl of Shrewsbury from whom it came to the Howard family (Dukes of Norfolk). While the Howards were responsible in the 1810s for the development of Glossop, it was the Sidebottom family who developed Hadfield. They bought the Waterside and Bridge Mill complex from John Turner and John Thornley in 1820. For three generations they developed these mills, as a large spinning and weaving combine. They built their own branch railway to the mill, and in 1880 ran 293,000 spindles and 4,800 looms. In 1896 the Sidebottoms went into liquidation. Bridge Mill was destroyed by fire in 1899, but Waterside Mill was bought by John Gartside and Co of Ashton-under-Lyne. Gartside's re-equipped the mills with automatic looms from the United States and installed new engines and electric lighting. During the First World War (1914–18), the mill was taken over by the Greenfield Mill Company but parts of the mill were used to produce munitions. After the war, the company declined. In 1940 the mill was occupied by Maconochie's Foodstuffs Ltd, which had been bombed out of its previous premises in London. By 1954, about half of the original building had been demolished, and more was to go. In 1976 the site was redeveloped and renamed as the Hadfield Trading Estate. Station Mill was built in 1834 by Thomas and Edward Platt, members of a family who had farmed Longdendale for generations. The family owned this cotton mill for 68 years, before selling it in 1923 to E. Wilman & Sons, which converted it to silk noil spinning. The mill closed in 1989. Hadfield Mills were corn mills from before 1819. In 1874 Thomas Rhodes and Sons converted the mills to the manufacture of cotton. There were 1,000 workers there in 1873 but it closed in 1932. In 1940 it was reopened by Hadfield Worsted Mills Ltd for cloth manufacture. Hadfield is administered by High Peak Borough Council at the Town/District/Borough level of Government, and by Derbyshire County Council at County level. Representation on Derbyshire County Council is split between the divisions of Glossop and Charlesworth, and Etherow – with the majority of the town being in the Etherow division. Etherow division contains Hadfield North, Hadfield South, Gamesley and the large and sparsely populated Tintwistle ward. Glossop and Charlesworth division contains amongst others Padfield ward (which takes the northern side of Station Road, the main shopping street). These boundaries were set in 2013. Hadfield does not have a parish council. The town is served by Hadfield railway station and Dinting on the electrified line. Hadfield is the terminus, all trains run through Dinting to Glossop and back through Dinting to Manchester Piccadilly. The railway, known as the Woodhead Line, used to run through to Penistone and Sheffield via the Woodhead Tunnel but passenger services were withdrawn in 1970. Goods trains ran until 1981 when Hadfield became the terminus. The trackbed to the east has been adopted as part of the Longdendale Trail footpath. The A57, which links Manchester to Sheffield via the Snake Pass, passes to the south of Hadfield, from Woolley Bridge to Dinting Vale. The A628 road, from Manchester to Barnsley and Sheffield over the Woodhead Pass, runs on the other side of the River Etherow through Hollingworth and Tintwistle. It is this road that the proposed Mottram–Tintwistle Bypass is to relieve. Hadfield is within close proximity of the Greater Manchester county boundary, and some services are provided with this in mind. Though lying within Derbyshire and the East Midlands, some of Hadfield's transport facilities are managed by the Greater Manchester Passenger Transport Executive, whilst Tameside and Glossop Acute Services, based in Tameside, Greater Manchester, is the NHS Trust which operates in the area. The town is served by Stagecoach Manchester bus route 237, going from Glossop to Ashton-under-Lyne, operating at alternating intervals of 20 and 40 minutes up until 6pm then running every hour, and High Peak bus routes 393, operating every hour to Padfield, Glossop and the Shirebrook Park estate; and 61B, which provides a once daily service to Chapel-en-le-Frith. The television series The League of Gentlemen was filmed in Hadfield, which doubled as the fictional town of Royston Vasey. In the film spin-off from the original series, The League of Gentlemen's Apocalypse, Hadfield appears as itself when the characters from the TV series enter into the real world through a portal below the church (actually in Ireland). The statue featured in the series and film's opening credits is the war memorial, commemorating lives lost in the First and Second World Wars. ^ "Hadfield South Ward population 2011". Neighbourhood Statistics. Office for National Statistics. Retrieved 25 March 2016. ^ "Hadfield North Ward population 2011". Neighbourhood Statistics. Office for National Statistics. Retrieved 25 March 2016. ^ Perkins, Helen. Old Ordnance Survey Maps Hadfield and Tintwistle 1907. Gateshead NE11 9BD: Alan Godfrey Maps. ISBN 0-85054-647-8. ^ a b Quayle, Tom (2006). The Cotton Industry in Longdendale and Glossopdale. Stroud,Gloucestershire: Tempus. pp. 96–108. ISBN 0-7524-3883-2. 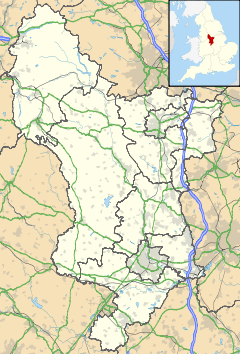 Wikimedia Commons has media related to Hadfield, Derbyshire. This page was last edited on 29 January 2019, at 12:59 (UTC).